Delicious! I used it as a main dish salad and so diced a few grilled chicken breasts and added it in. Combine and pour over coleslaw, toss to coat. Keep refrigerated until serving. Now I also have to tell you my recipe for the best ranch dressing. Actually, it is from my step-mother - something I always enjoyed as a child and I finally asked what she does to make it so good. Start with the Hidden Valley Ranch Buttermilk Dressing Mix (the nice little packet) and use REAL buttermilk and Best Foods Mayonnaise. I don't know why, but other mayonnaise brands that I have tried with this just never taste the same or quite as good. Maybe it's tied to the whole childhood memories things and familiarity or whatever, but it really does make the best tasting ranch dressing. In a mixing bowl, cream butter and sugars. Beat in eggs, bananas and vanilla. Combine flour and baking soda; add to creamed mixture just until combined. Stir in the walnuts and chocolate chips. Fill greased or paper lined muffin cups half full. Bake at 350F for 15-20 minutes or until a toothpick comes out clean. Cool for 5 minutes before removing from pans. Note: I have a child who doesn't do nuts in baked goods, which makes it hard for him because Dear Husband thinks everything should have Extra Nuts! So, when I can, I make things without nuts - this, breakfast when DH was already gone to work, was one of those times. Another Note: In all of my baking, I now use organic cane sugar or Turbinado (raw) sugar. They are less processed and actually have their natural minerals intact, as well as requiring MUCH less processing and chemicals than regular white sugar or brown sugar which in most cases is simply white sugar with brown coloring. Now, I don't have a picture of these - in all honesty they were gone before I ever thought of pictures BOTH Times!! - but since Mrs. C has requested the recipe, I'll go ahead and post without photos. You'll just have to make them for yourself to see how yummy and delicious they are! In large mixing bowl, dissolve yeast in warm water. Add milk, sugar, shortening, eggs, salt and 3 1/2 c. flour; beat until smooth. Stir in enough remaining flour to form soft dough. Turn onto a floured surface, knead until smooth and elastic, about 6 - 8 minutes. Place in a greased bowl, turning once to grease top. Cover and let rise in a warm place until doubled, about 1 hour. Meanwhile, in a large skillet, cook bacon over medium heat until crisp. Using a slotted spoon, remove to paper towels. In large skillet (no bacon grease) cook beef, onion, salt and pepper over medium heat until meat is no longer pink; drain. Add bacon and cheese; cook and stir until cheese is melted. Remove from heat. Punch dough down. Turn onto a lightly floured surface; divide into fourths. Roll each portion into a 12-in. x 8-in. rectangle; cut each into six squares. Place 1/4 cup meat mixture in the center of each square. Bring corners together in the center and pinch to seal. Place 2 in. apart on greased baking sheets. Bake at 400F for 9-11 minutes or until lightly browned. Brush with butter. Serve warm. NOTE: This is a nice tasting dough recipe but you may use any bread dough you like, and/or make it in the bread machine, too! (On the dough cycle,of course ;-) These are great for the freezer, if they make it that long. The first time I made these, we were heading out camping so I wrapped them in foil and then in a towel and brought them along. We enjoyed them after we had unloaded and set up camp and all thought they were just about the best thing we had ever eaten -- but you know, being outdoors makes just about everything taste better! I made them again when we were home, just to confirm, and they disappeared once again. In large skillet, cook the sausage, mushrooms and onion over medium heat until meat is no longer pink: drain. In large bowl, whisk eggs, milk, mustard, salt and pepper. In greased 13x9 baking dish, layer half of the bread cubes, tomatoes, sausage and cheese. Repeat layers. Pour egg mixture evenly over the top. Bake, uncovered, at 325F for 50-55 minutes or until a knife inserted near the center comes out clean. Let stand for 10 minutes before serving. 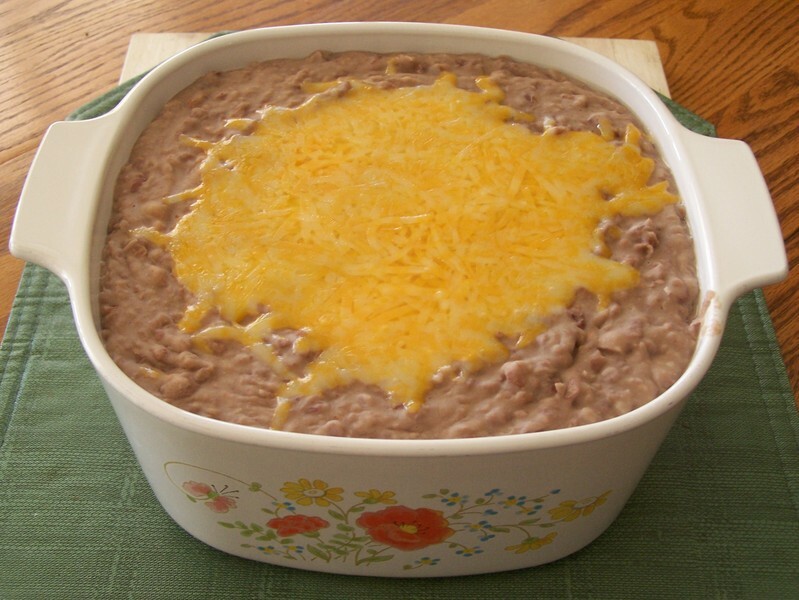 We've been making our own Refried Beans for almost a year now and they are truly one of our favorite things -- and so simple, too! 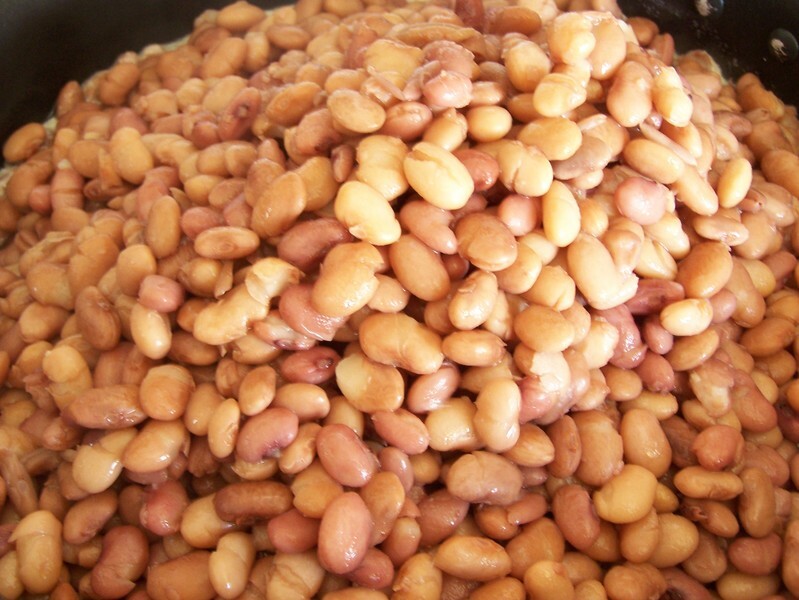 I soak 4 cups of Pinto beans overnight or all day in a pot full of water. When you're ready to cook them, drain and rinse the beans. Back in the pot they go, again covering them with plenty of water. Bring to a boil and then turn heat down to a nice simmer - med/low on my stovetop. Cook for two to three hours until beans are very tender. Do NOT drain beans. Aren't they just lovely? Now the fun begins! In a large skillet - I use a 12 inch - melt one stick of butter over medium heat. 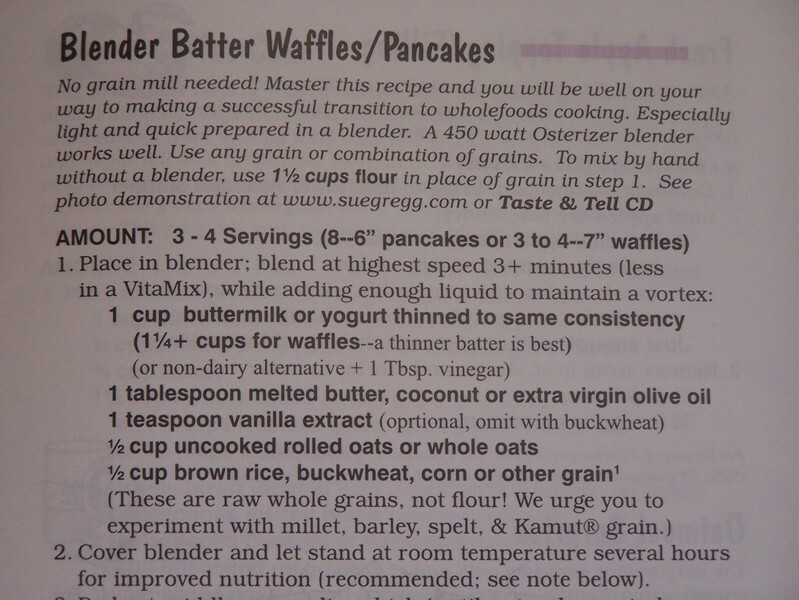 Yes, 1/2 cup of butter. It's delicious! Once your butter is melted and bubbly, use a large slotted spoon or whatever is handy to get the beans from the pot with as little liquid as possible. I have a great big ladle thingy where the bowl is actually a screen and it works wonderfully! If you don't have anything appropriate, you could drain the beans into a colander over a large bowl in order to save the liquid for a later step. 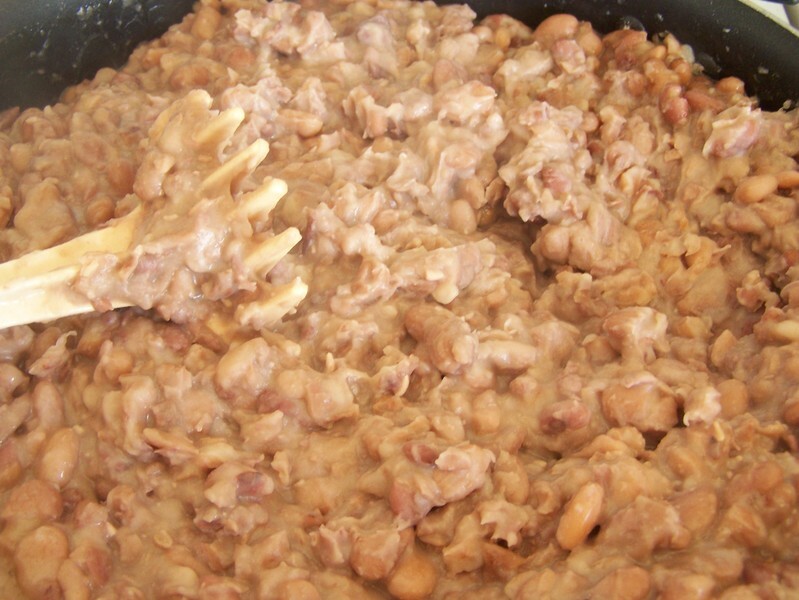 Once the beans are in the skillet, add 1 1/2 teaspoons of salt and start mashing. I use a hand masher that I got from Tupperware a few decades ago. Mash until the beans are as smooth or as chunky as you like them. Now, add the bean liquid back into your beans about 1/2 cup at a time, stirring until completely mixed in and until the beans are a consistency that you like. Some people like their beans thicker, others a little wetter. Now is also the time to taste test and see if you need to add a little more salt. A word of experience: When the beans are just like I want them, I add a little more liquid. As they cool they will thicken up and since I make a large batch for us to have with multiple meals/recipes, it's easier to re-use them if there's a little extra water to begin with. Enjoy! Today we're eating our beans for lunch with chips and salsa, tomorrow the leftovers will be used in Mexican Pizzas!
. . . AND like it! How? I put it in a pumpkin! I've been menu planning this month with my Taste of Home magazines and this current issue is brimming with delicious recipes. I chose this one because first of all it was different, it uses a whole pumpkin, and did I mention it was different? Everyone loved it and even after husband found out it had brown rice -- he still had seconds and finished the rest of the leftovers today! Meanwhile, in a large skillet, cook sausage over medium heat until no longer pink; drain and set aside. In the same skillet, saute the mushrooms, onion, shallots and garlic for 3-5 minutes or until tender. Reduce heat; add the currants, broth, poultry seasoning, sage and marjoram. Return sausage to the pan. Cook and stir for 5-7 minutes or until liquid is absorbed. Remove from the heat; stir in rice. Wash pumpkins; cut a 3-in. circle around each stem. Remove tops and set aside. Remove and discard loose fibers; save seeds for another use. Prick inside each pumpkin with a fork; sprinkle with salt and garlic powder. 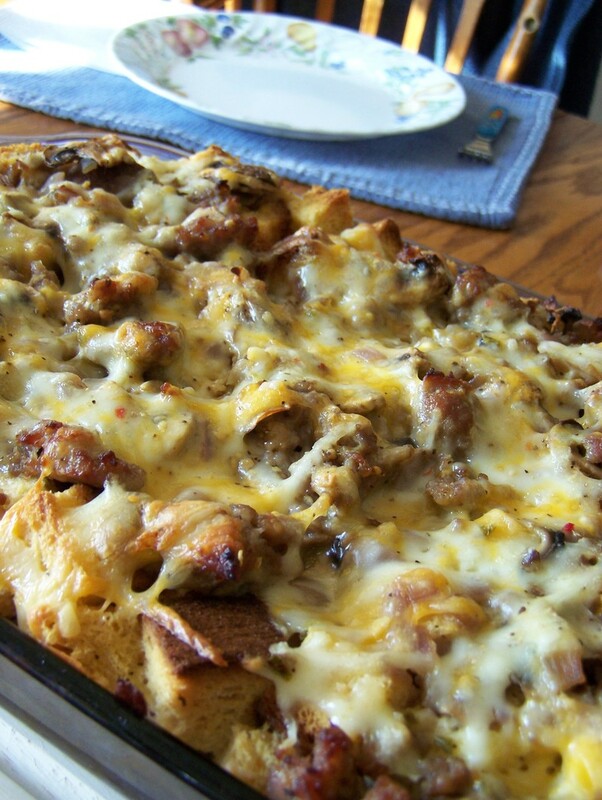 Stuff with sausage mixture; replace tops. I was handed a free little cookbook at the last homeschool convention (Her cookbooks are on my Really-Wish-I-Had list so I was browsing the table to see if any were on sale!) 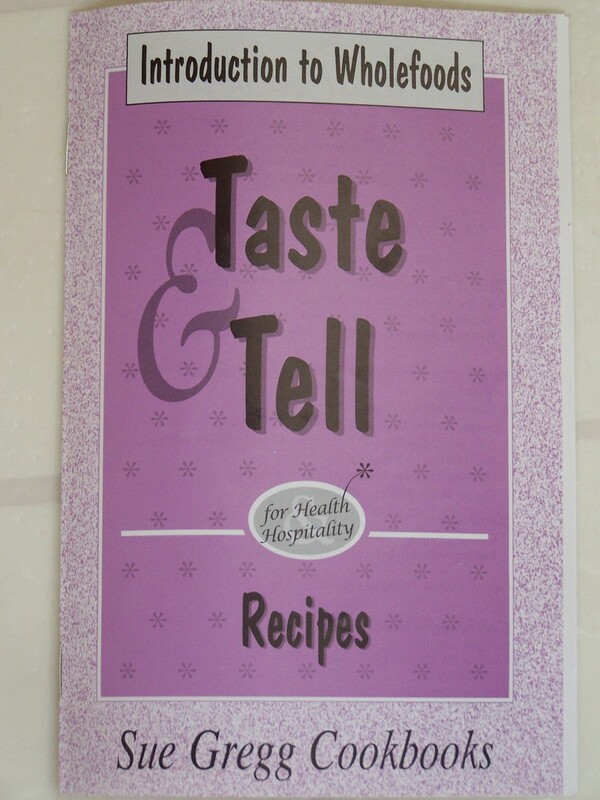 and I've been thrilled with the recipes and ideas that are inside. So, this morning I tried the first recipe in the book -- well, actually I did it last night. You see the key is soaking. Allowing your grains to soak all day (for dinner) or overnight (for breakfast the next morning) in some buttermilk or whey (the liquid that you drain from good quality, plain yogurt.) This breaks down the phytates (phytic acid) in the grains and not only makes it easier to digest, but makes the vitamins and proteins more available for you to absorb. Back to the recipe: Last night I put some buttermilk in the blender, and added rolled oats, brown rice, cracked wheat and millet. I mixed it (in the blender on a good, high/chop speed), let it sit overnight, and this morning simply added an egg, some baking soda and salt. Voila! My pancake batter was done! And you know the best part? It was really good! They had a nice, subtle flavor to them and with a light drizzle of warmed honey on top - they were perfect! 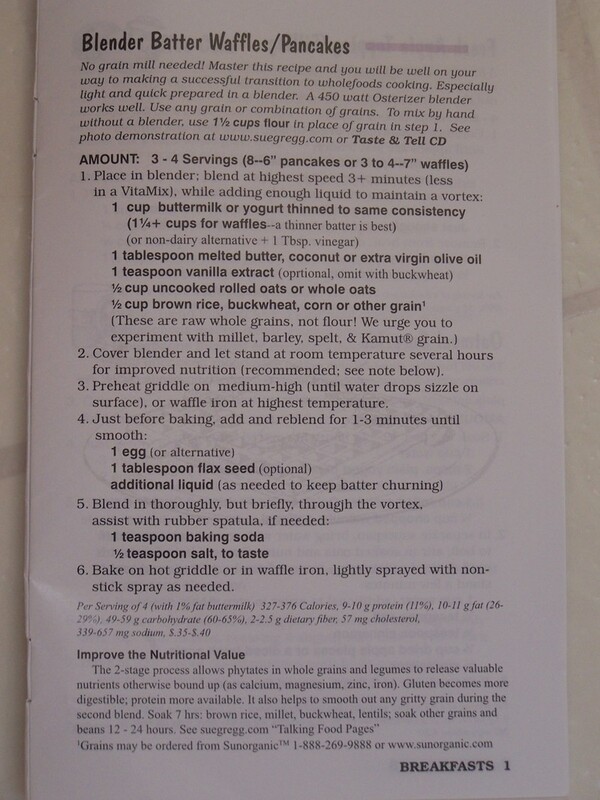 Here's the recipe for Blender Batter Waffles/Pancakes. Follow the links at the bottom of the page (Continue Lesson #1 >> ) for LOTS of great information on Ingredients and Methods, the Two Stage Process, Nutritional Benefits, a Comparison of Nutritional Values, and More!! Please visit Mrs. Gregg at SueGregg.com for a refreshing waterfall of information about her, her cookbooks, and healthy recipes that take you by the hand, step-by-step, for great results! And for some extra nutritional information, read these two great entries about "Phytates and the Two-Stage Process" as well as Mrs. Gregg's review of the book Nourishing Traditions. It's a beautiful morning here with the sun shining brightly, the birds calling and the sound of the leaves rustling in the breeze. Although my house is still a mess, I am just trusting the LORD and focusing on only what is the next thing. I cannot do it all at once - all I can do is the next thing, and do it cheerfully. We did our bible reading together this morning and then the children got started on schoolwork while I made these delicious muffins. Daughter said they were better than our Peanut Butter Muffins. Young son who loves all things blueberry said that we should just add blueberries to the Peanut Butter Muffins. ;-) But both he and middle son thought these were better. My two cents is they are both great - they are just different and it depends what you are in the mood for! Now I'm off to assign chores and schoolwork then start working, one clutter spot at a time, on cleaning the house. In bowl, cream together butter and brown sugar. Beat in egg. In another bowl, combine all dry ingredients, mixing well. Add dry ingredients alternately with milk to the butter mixture. Stir until combined but do not overbeat. Fold in blueberries. 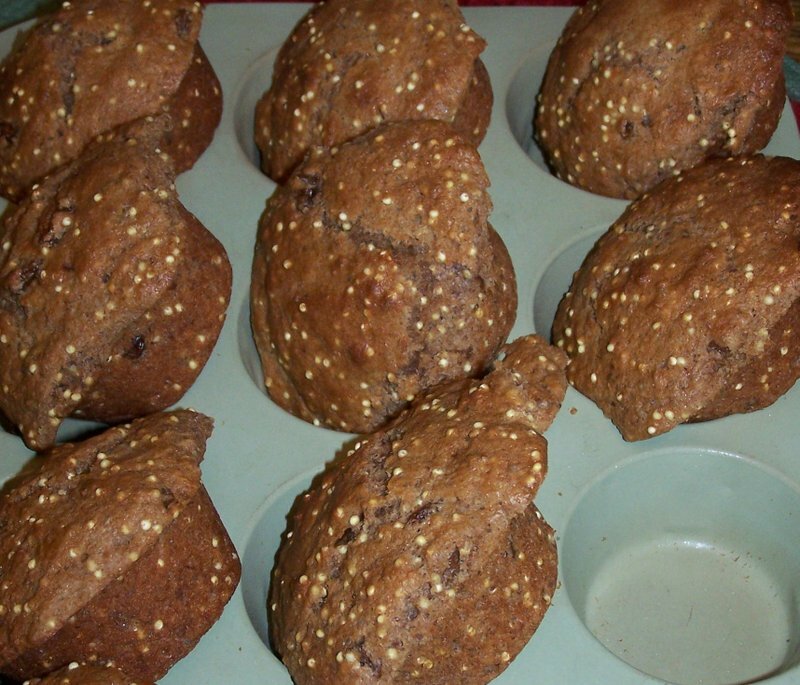 Fill greased muffin pans evenly with batter. Sprinkle Crumb Topping gernerously over each muffin. Bake at 400F for 20 minutes. Allow muffins to cool a few minutes in pan before lifting out. Crumb Topping: Combine 1/4 c. brown sugar, 1/3 c. whole wheat flour, and 1/2 t. cinnamon. Cut in 1/4 c. butter until crumbly, like sandy pebbles. Are you always seeking new recipes? Then I NEED your help!! I don't know what is going on lately, but in the past two weeks I have received four, 4, FOUR! !, letters about recipe exchanges! First my cousin, then my mom, then my grandchildren's other grandmother, and now my sister-in-law. What is happening here? Is spring the season for recipe exchanges and no one told me? BTW, the picture above is a Giant Ding Dong Cake I made a few months ago. Yeah, it really does taste like a ding dong. 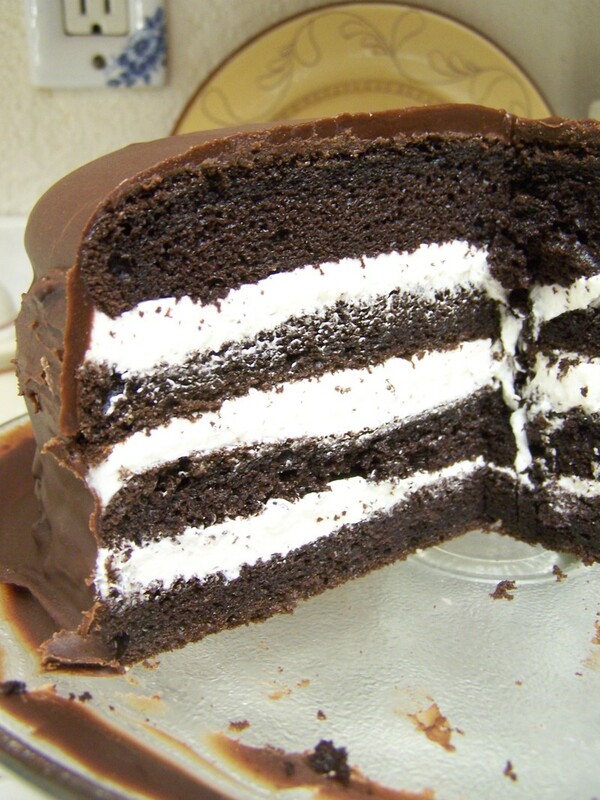 :-) If you make it, I would suggest making it in layers like I did above, rather than strictly according to the recipe. Having a center full of fluff is fine when you're holding a little circle in the palm of your hand - but when it is in an 8 or 9 inch cake it's a little overwhelming! We try to include as wide a variety of grains in our diet as often as we can. 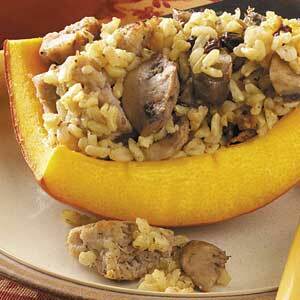 And millet is certainly one of the easiest to include with its mild flavor and abundance of uses. Click HERE to read so much more about this versatile grain and all of the health benefits it carries! 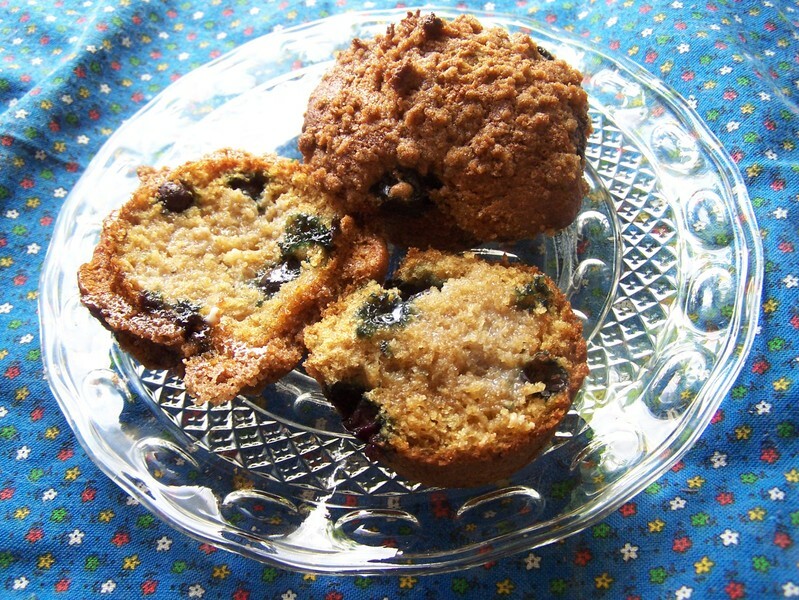 One of the ways we use millet for breakfast is this great recipe for muffins that I found a few years ago. Add wet ingredients to dry ingredients and stir until just moistened (no more dry spots). Add whatever dried fruits or nuts you like - currants, raisins, cranberries, apples, apricots, walnuts, almonds, pecans, etc. Pour into 16 greased muffin cups and bake at 400F for 12 minutes. The millet in these muffins is like a tiny nut crunch, Yummy! NOTE: To boost the nutrition in these muffins, I regularly will substitute 1/4 - 1/2 cup of flax meal for an equal amount of flour.